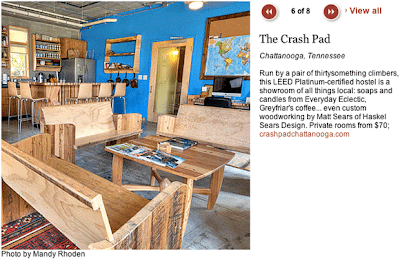 Chattanooga Real Estate Update: Chattanooga hostel makes Southern Living list of Top B&Bs! Chattanooga hostel makes Southern Living list of Top B&Bs! "Forget doilies, chintz, and potpourri. These next generation B&Bs give the bed-and-breakfast routine a welcome upgrade," says Southern Living's Stirling Kelso. Their list of the South's best bed & breakfasts also includes accommodations in Orange (VA), Charleston (SC), Talpa (TX), Mobile (AL), Sperryville (VA), and Roundtop (TX).